The Lake Merritt Master Plan was the outcome of a year-long process involving citizens in design charettes and community meetings. These sessions focused on key elements to restore and enhance the Lake and its park area, and community participation was strong – over 200 residents took part in the numerous meetings held. The Council approved the Master Plan in 2002. Related background documents can be viewed at the City's Lake Merritt Master Plan web page. 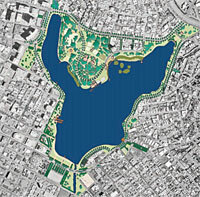 View Lake Merritt Master Plan.